Posts Tagged "Endless Echo Hat"
Home » Posts Tagged "Endless Echo Hat"
Heidilee, Design Alchemist, on Fifth Avenue at the Easter Parade in 2015. She calls herself The Mad Hatter on her Facebook page. 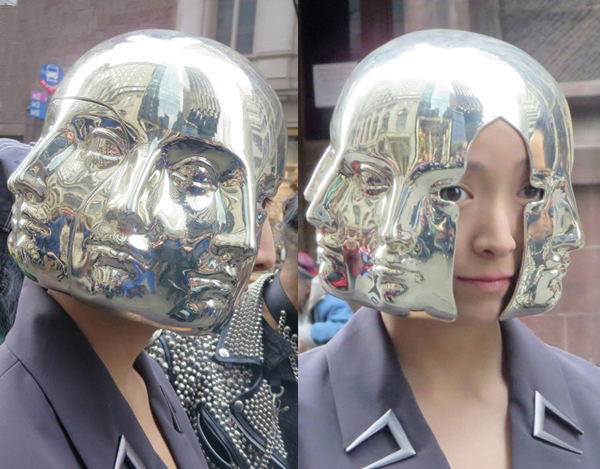 Here she is wearing her “Endless Echo Hat” made of Chrome, with many faces in 3D printed from a scan of her own face. Brilliant. Love it. Art and Symbolism? Surreal Modern? Sci-fi movies and Salvador Dali are influences. She’s won some major awards like the Metropolitan Museum of Art Institute Accessory Design Award 2012 and she was the Fashion Group International Rising Star Award Nominee 2013. Check out her Echo Hat in Italia Vogue March 2015 (Steven Klein cover story photos.) Heidilee is a talent to watch.